As we advised recently, the Church Renewal Committee is currently working through the planning process, considering how the church can be shaped and ordered to best fulfil the vision articulated by parishioners during the consultation process. The Guiding Concepts developed from this consultation are, therefore, an important measure to work by. Many parishioners during the consultation period have spoken about the placement and arrangement of the sanctuary. This, in turn, obviously has implications for the placement and arrangement of the liturgical assembly that gathers before or around it. 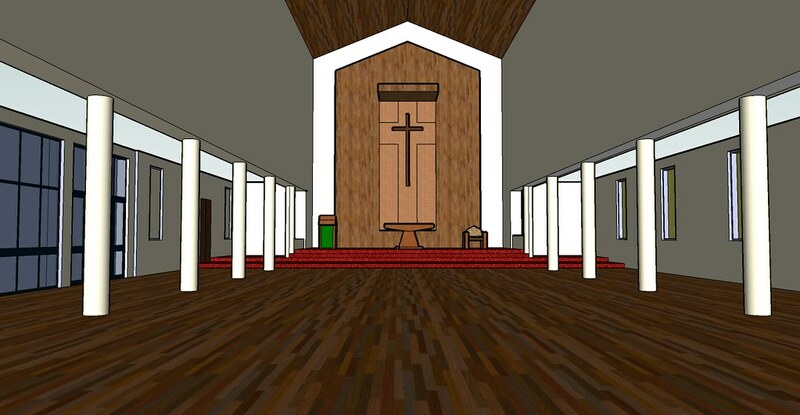 The suggestions made for the placement of the sanctuary stem from a range of concerns, including visibility of the sanctuary from within the church and narthex as a focal point within the space, and providing an increased sense that we actively participate in, and not just observe the Eucharistic celebration. The church needs to be arranged such that, as much as possible, the community is gathered around the altar and ambo, giving the sense that all of us gathered participate in the celebration of the Eucharist. While this can be very easy to achieve in a new building, it is a greater challenge when renovating an existing building such as ours, where a balance must also be found with our other hopes for the church, maintaining a reasonable seating capacity, and respecting the architectural integrity of the building which, for better or worse, has been built in a way that naturally sets its focal points along its north-south axis. The Church Renewal Committee will continue to consider how the church can be best ordered to fulfil the vision articulated in the Guiding Concepts. In the meantime, remember the look at the additional material provided at http://www.olmcwenty.org.au/churchrenewal. Thank you also to those who have recently send in feedback about the process – it is always welcome, and can be given to Fr Paul, myself, the parish office, or emailed to litcomwenty@gmail.com.